The five women’s athletic teams were given a list of seniors and statistics in place of photos. Many seniors look forward to receiving their copy of The Summit Yearbook after graduation. 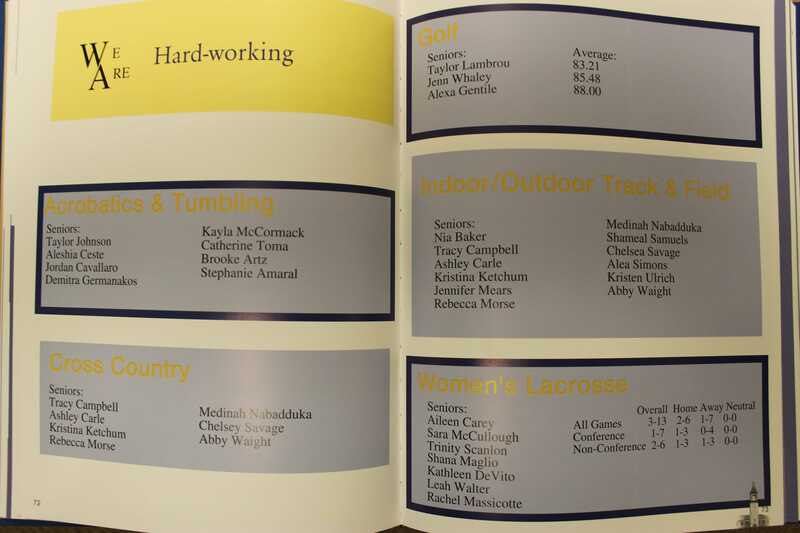 However, Kristen Ulrich, a 2016 graduate and a former member of the women’s track and field team, received her yearbook in the mail recently and noticed that six Quinnipiac athletic teams were not given the same representation in the yearbook as the other athletic teams were. Five Quinnipiac women’s athletic teams and one men’s athletic team were left without pages in the 2016 edition of The Summit Yearbook. Women’s golf, women’s track and field, women’s cross country, women’s lacrosse, acrobatics and tumbling and men’s cross country were the teams that were excluded. 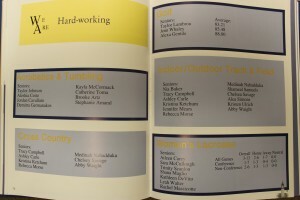 The five women’s teams were given small boxes on a page entitled “We Are Hard-Working” at the end of the sports section of the yearbook listed names of seniors, as well as some statistics for some of the players. There was no information printed about the men’s cross country team. Editor-in-chief of the 2016 yearbook, graduate Megan Alderman-Person, said the problem was not having enough photos of these teams to include in the book. While Ulrich believes the yearbook staff could have prevented the exclusion, she also believes much of the reason has to do with the lack of coverage of those specific sports from the university. Alderman-Person said the yearbook staff tries to outsource other media groups to use photos, and she has also found that the coverage of those six sports is very low. There is a disconnect between the teams that were excluded from the yearbook and university coverage in the media, according to Ulrich. There is also a history of some teams not being included in the yearbook. According to Alderman-Person, neither the women’s cross country team nor the women’s golf team were included in the 2014-2015 yearbook either. Jennifer Whaley, captain of the women’s golf team for the 2015-2016 season said having names and scores listed doesn’t do justice for her four years committed to Quinnipiac athletics. Ulrich said that because of Title IX, there are more women’s teams than men’s teams and that each team is paired. For example, women’s softball and men’s baseball are paired and women’s soccer and men’s soccer are paired. Acrobatics and tumbling, women’s golf and women’s track and field do not have comparable men’s teams. The men’s lacrosse team was paired with field hockey instead of with the comparable women’s lacrosse team in the yearbook. Many of the athletes feel as though the lack of inclusion of their teams in the yearbook leaves out many of their accomplishments during their seasons. The women’s cross country team won the MAAC Championship, dethroning the previous 11-time reigning champion, Iona. The women’s golf team went to the NCAA Women’s Golf Championship Regional. Acrobatics and Tumbling competed at the national championships, won two events titles and advanced to the semifinals. Tracy Campbell, a 2016 graduate who was on the women’s cross country and track and field teams said the seniors who did buy the yearbook were very upset with the situation. “They’ve spent four or five years representing the team and then spent the money to buy the yearbook for the memories and to see their accomplishments and felt extremely disrespected when they realized our teams were not in it,” Campbell said. Alderman-Person said the yearbook staff tried their best to include as much of the university as they could.